Comment: Shiny golden yellow-green chrysoberyl in a cut that demands highest clarity and a fine crystal, both features are well presented. A vertical veil is visible only under the lens, and a delight for those who appreciate such natural details. The gem's depth with 59% and its dimensions of 10x9mm point to a shallow center, which is visible in our images, too. This shallow center must be called windowed but its symmetry and moderate size does not suggest a re-cut, especially for a setting with an open back, which would render the window invisible (please ask if this is not clear). As so often, the low depth produces an extra big face, even for a 4+ carat chrysoberyl. 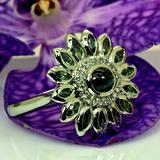 Our photos give a realistic impression of the lively and shiny crystal this gem is blessed with. 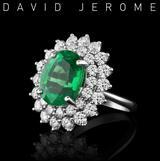 Such shape and size will make an impressive jewel, demanding attention and rewarding with its rich, though bright, color and an adamantine luster. Never pale, and no grey what-so-ever. Sharp and precise cutting, obviously a uniquely hand-crafted item but without any flaws or imperfection. Blazing neon under sunlight (see 'more images'). Full size for a classy ladies-ring, and big enough for a pendant. Let us design a setting that will neutralize the window.